The words are James Clancy’s, and they are repeated frequently every day at Clancy’s Produce Stand on West Maxwell Avenue. “You could tell she had nothing, she was hungry, she comes by a lot,” said Clancy out loud to no one in particular, sending away the customer with a bag full of limes and other fruits and vegetables without charging her a dime. That’s Clancy’s Produce for you. The semipermanent fruit stand sits just west of the Maxwell House Tavern at 1425 N. Ash St., on land borrowed from the tavern. The stand is neat and orderly, covered by a tent, with produce boxes holding today’s selection lined up on folding tables. It’s open on weekdays from April through October, and Clancy has been running it since 1991, but he’s never made any money in the produce business. Everything he makes goes straight to charity in the West Central neighborhood. Clancy’s wife Judy had two heart attacks before Christmas and has spent some time in the hospital. He doesn’t like talking about that. He worries, he said, but he has good insurance – many of his customers don’t. “I pray for her every night, and when she’s in the hospital I go and see her as often as I can,” said Clancy, looking away. He is much more comfortable talking about his produce stand, which compared to other places features ridiculously low prices. That’s because most of the produce is donated “leftovers” from wholesaler Pierone’s Produce. “There’s nothing wrong with it, it’s just not an amount they can sell or the box is broke or something,” Clancy said, adding that he’s worked with Pierone’s for 20 years. Proceeds from Clancy’s Produce are donated to many charities and nonprofits, including COPS West, West Central Community Center, The Spokesman-Review Christmas Fund and the Union Gospel Mission. Born in 1927 on the East Coast, Clancy retired from the military in 1968. He came to work for Spokane Transit Authority – his wife Judy’s family is from Spokane – and said he was driving the East Fifth Avenue route one day contemplating what to do when he retired. “And it just came to me that I was going to have a produce stand like this,” said Clancy. He retired from STA in 1991. 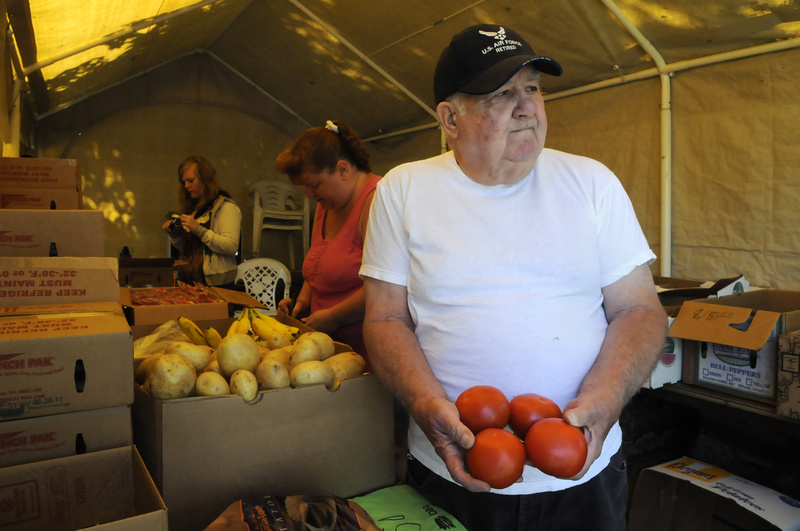 He used to go out to the Spokane Valley and pick some of the produce, but he doesn’t do that any more. There’s a tip jar on the counter for gas money, to help pay for the drive out to Medical Lake where Pierone’s warehouse is located. “Gas was 49 cents a gallon when I started. Today I paid $3.73,” said Clancy, trailing off as another customer stopped by. The young man eyed the lettuce and apple slices. He leaves with those, and a melon, for a bit of change. Neighbors help him stock and staff the produce stand when needed, and he said he feels blessed knowing the people in the West Central area. Listening to Clancy is like listening to a baseball announcer’s play-by-play, except Clancy doesn’t talk about baseball, he talks about his customers, the neighborhood and life in general. And his commentary is compassionate and kind – he is no curmudgeon.